Poor little Pablo has been suffering from eczema that makes him so itchy he scratches himself raw. Cousin Q's older brother's wife got him tested and it turns out the little guy is allergic to wheat, soy, egg whites, shrimp, and peanuts. Since she's still breastfeeding him, she's had to eliminate those foods from her diet as well. So the other day while I was making Cha Gio (Vietnamese Egg Rolls), I decided to do a minimalist version without shrimp, eggs, or wheat wrappers. It wasn't hard. I just went back to my roots. Traditionally, Vietnamese spring rolls are made with fried rice paper so they've always been naturally gluten-free. :P Bwahaha! It's a Vietnamese American adaptation to use Chinese egg roll wrappers because rice paper wasn't available when the refugees first arrived. 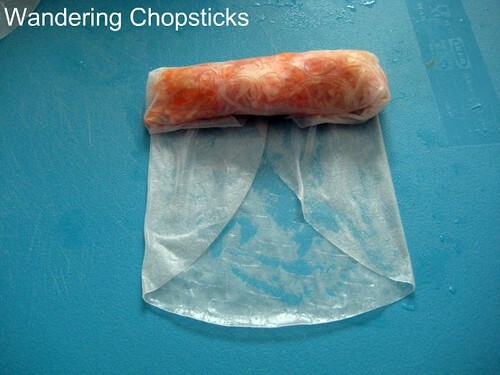 Now, egg roll wrappers are often used for ease and convenience. Even though I mentioned using rice paper in my regular cha gio recipe, sometimes it's nice to have a new post for the specific ingredients I have in mind. Plus, old recipe posts benefit from improved photography. If you're not allergic to shrimp, by all means, add some in if you wish. I'd normally add tree ear fungus too, but didn't realize I didn't have any in the pantry. 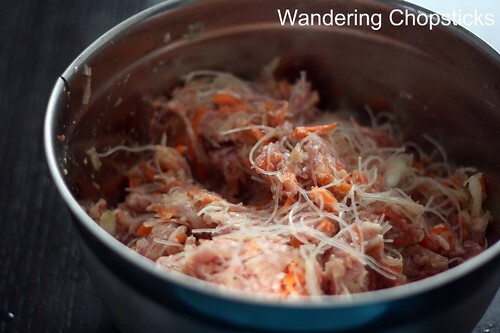 The filling was simply pork, vermicelli noodles, and grated carrots and onions. Easy peasy. Don't be deceived by the color. Even though the spring rolls are still mostly white, the natural color of the rice paper, they're still crispy on the outside. The inner part of the wrappers will be chewy. 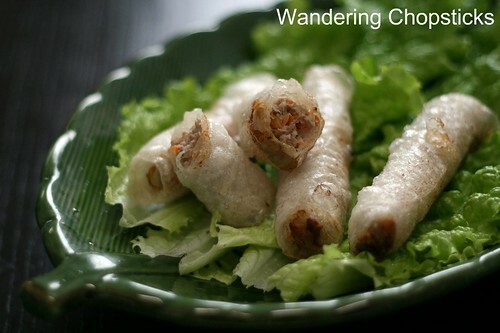 The crisp chewy texture is just the natural difference between rice paper versus egg roll wrappers. 1 package rice paper wrappers. I prefer Three Ladies brand. Optional: Ground turkey or chicken may be substituted for the pork. Add 1 cup minced shrimp if you're not allergic. Add finely shredded cabbage if you'd like more vegetables. Add minced crab to make it even more flavorful. Vegetarians may substitute the meats with fresh tofu. Add 1 cup dried mushrooms, soaked and sliced, or 1 cup Tree/Wood Ear Fungus/Mushroom, soaked. Place the bean thread vermicelli noodles into hot water to soften. Squeeze vermicelli and mushrooms dry and allow to drain. 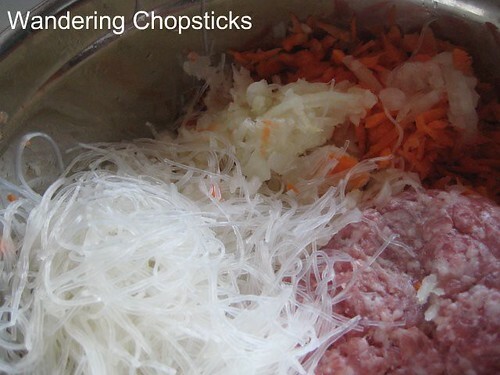 Cut vermicelli into two-inch segments. I use a pair of scissors for ease. Cut off mushroom stems and slice thinly. Sometimes tree ear fungus is sold pre-sliced, if not, then slice into strips. Grate the onion first and squeeze to remove excess water. Grate one or two carrots. Add 1 lb ground pork. Add 1 tsp salt, 2 tsps sugar, 2 tsps fish sauce, and 1 tsp ground black pepper. Mix everything thoroughly. To check for taste, I usually take a tiny lump of the meat and pop it into the microwave for 30 seconds or so. It's easier to adjust seasonings if necessary this way. Just remember to factor in that the fish sauce will make the mixture saltier as it gets absorbed and cooked. It's best to work with about two rice paper sheets at a time. On the left is the rice paper before being wetted, on the right, I've just splashed it with water on both sides. Have a large bowl of warm water on hand and just wet the rice paper in the bowl or do it under running water. There is no need to let the rice paper sit in the water. It will become pliable in a few seconds. 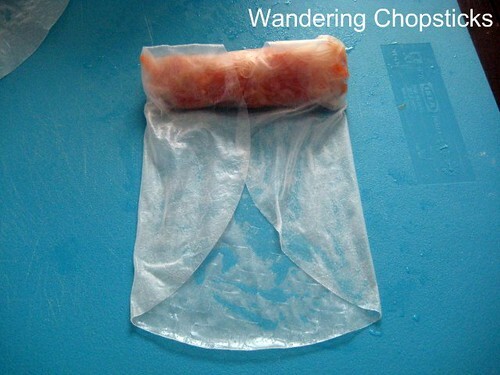 So wet one rice paper sheet and leave it to become pliable. Then wet a second sheet and leave it to become pliable. Return to the first sheet and it will now be pliable enough to roll. 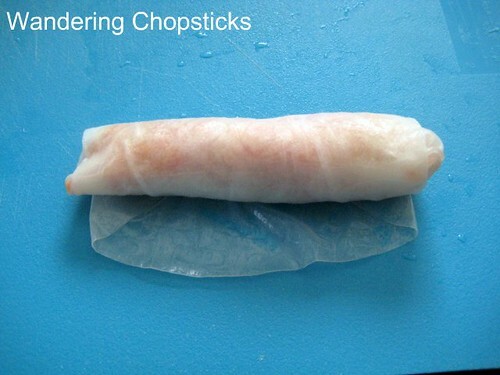 When you finish rolling, set the spring roll aside to dry out. Wet another sheet, and leave it. Return to the second sheet, which has now become pliable, and roll it. Repeat as desired. Now, in rolling an egg roll, don't be greedy. A tablespoon or two is more than enough filling. Spread it out on top of the wrapper. See the other sheet in the top corner? It has just been wetted (Yeah, I made up that word.) and is just resting until it becomes pliable? Fold down the top and pinch in a bit to make the filling tight with the wrapper. It's not just aesthetically pleasing to make a tight roll, it also keeps out excess oil when deep-frying. 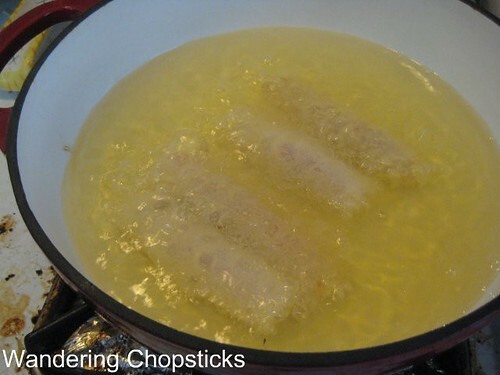 Set the finished egg rolls aside to dry out as much as they can before frying. I usually fry on medium-high heat. 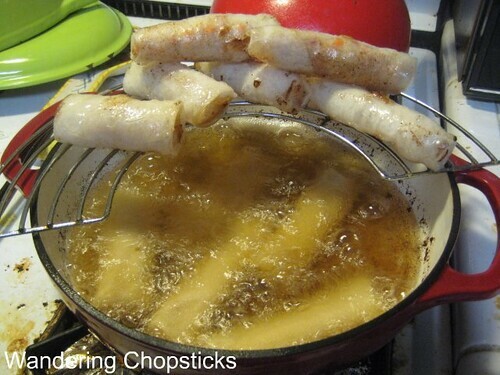 When the oil is hot, add the egg rolls. Both my woks had stuff in them and my sink was full so frying with a cast iron pot works well too. The wok frying thingy is one of my favorite low-tech kitchen gadgets. Drain on paper towels or paper bags. Serve with lettuce and Nuoc Mam Cham (Vietnamese Fish Dipping Sauce). Crispy outside, moist chewy inside. Traditional Vietnamese spring rolls are naturally gluten-free. 1 year ago today, sugarloaf pineapple. 2 years ago today, what are your sink habits? 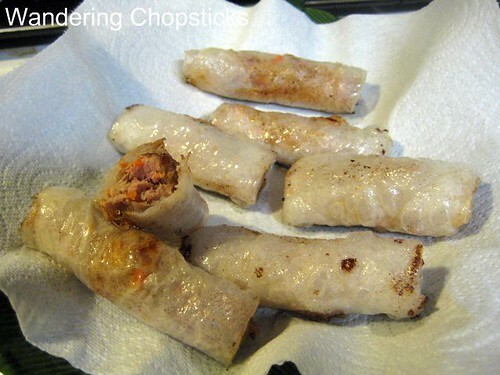 3 years ago today, a Vietnamese rice paper recipe with diasporic roots - Bo Bia (Vietnamese Spring Rolls with Chinese Sausage, Shrimp, Eggs and Jicama with Peanut Hoisin Dipping Sauce). Poor Pablo! At least hopefully now he'll be relatively free of eczema. Those egg rolls look delish! This looks great WC! I always wondered.. can you deep fry a giant Goi Cuon? Or am I just crazy? 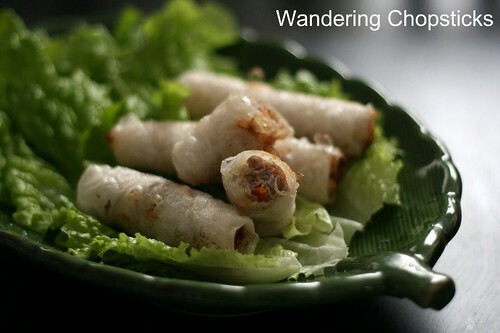 Or does Goi Cuon naturally translates to becoming Cha Gio if it is deep fried? I LOVE RICE PAPER EGG ROLLS! They take longer to fry up and stick to my teeth like crazy, but they're still my favorites. Hope poor little Pablo grows out of his food allergies. Ohhhhhh you've reminded me of university days when my best friend and I would make rice paper spring rolls together for lunch. She was vegan, I had gluten allergies, so I'd cook up some textured soy protein with vegetables, slice up some fresh veggies (if I wasn't being lazy) and we'd wrap and eat and have a glorious time. I am -going- to try this! Funnily enough it never occurred to me that you could deep fry rice paper rolls...I don't deep fry often but this just may convince me to try it. Best wishes to Pablo and his family - I know first-hand how hard food allergies can affect diet when they're first discovered. Fortunately there's a wealth of wonderful information, recipes and blogs out there these days dealing with these difficult issues. I wish they'd been available when I was diagnosed! My son just did his allergy test Monday ... he doesn't have allergies. He just have a very bad case of eczema ... around his eyes and ears ... and some on his hands. Funny thing is, he just started to get eczema now at age 5! All the best to little Pablo! I was told sometimes they grow out of it! Fingers crossed! As always, I love your recipes!!! Can't wait to eat those delicious Vietnamese Foods in Aug when I come to visit! Hopefully after eliminating those foods the poor kid will catch a break. Goi cuon means salad roll. Cha gio is loosely translated as a meat paste roll. Although, they both have pork, shrimp, and noodles, the pork and shrimp in a salad roll are already cooked and are in large pieces. Also, goi cuon uses rice vermicelli, not bean thread vermicelli noodles. And then all the lettuce and herbs would not turn out well if they were deep-fried. It's funny. I always try to make both versions just because I like the difference in textures. I can't imagine having food allergies. So not fun! I thought of you too when I was writing this post. Oh no! Seems like a lot of kids these days are developing eczema? I just made some with foraged black trumpet mushrooms, chanterelles, and hyper-thin rice paper. A prize a brought from Vietnam. So yummy! Are you going to be like the Scots? Deep-fried Mars bars anyone? Sounds good! I love mushrooms. Hi WC, I PREFER the rice paper spring rolls! Always have. And yeah, they take a gentle hand, but they are so good. I've tried dipping the rice paper in beer, anything to try and get more of a browned look after frying, which some people manage...My son has excema as well, no fun. But no wheat allergy, either. Dairy is often the culprit. Good luck to any mothers struggling to tamp down the nastier outbreaks! I always make both now. I don't know how some people get them brown. Mine get maybe a little golden but are still obviously white. Now, it looks like the poor guy is allergic to squash too! I first tasted these rolls in a Chinese restaurant in Port-au-Prince, Haiti. I was 8 or 9 years-old. It was years before I knew that these were actually vietnamese spring rolls. 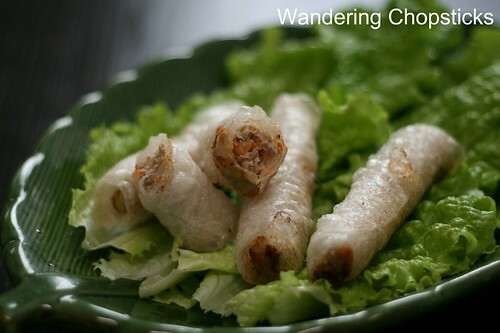 I am writing you to thank you for answering a question that both my bnoyfriend and I have been asking ourselves for a while now: why are the spring rolls that I had as a child and the ones we've had in France so different from the ones we've eaten in Canada (i.e we don't really like the ones in Canada)? Was it because the Vietnamese who immigrated to France were from a different region than the ones who immigrated to North America? The answer, a simple one, different wrappers. We simply like the rice-paper wrapped spring rolls better than the other ones! 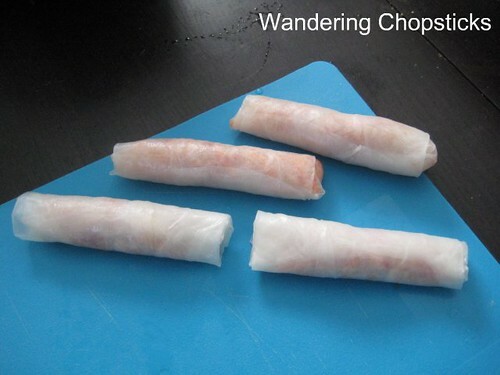 Next weekend, we are going to try making our own Vietnamese spring rolls. Can't wait to see/taste how it turns out. The coolest part is that you were at a Chinese restaurant in Haiti?! Although, it is odd that they used Vietnamese rice paper wrappers. I wonder if the owners couldn't obtain Chinese wrappers, or if they were actually Vietnamese but opened a Chinese restaurant instead? Yes! Yes! Yes! I am always so disappointed with the restaurants that use the Chinese egg roll wrappers! 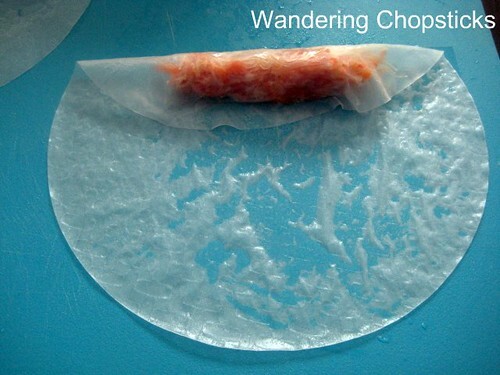 I miss the stick-in-your-teeth chewiness that comes with the rice paper skins. The same restaurants that serve the summer rolls in rice paper, and then tell me that they can't fry rice paper. . .And I am American, not Vietnamese at all! UGH! Thank you for setting the record straight. I am not crazy! When I fry them, my rolls end up with bubbles. Do you know why this happens? 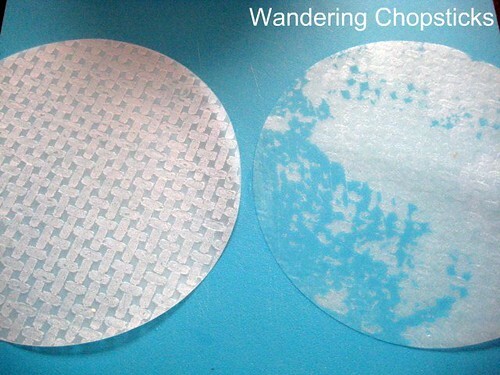 Do you have a picture of the type of wrappers you use? Should the wrapper's ingredients not have starch in it? I like both, but I do like the light outside, chewy inside of the Vietnamese rice paper wrappers. Haha. 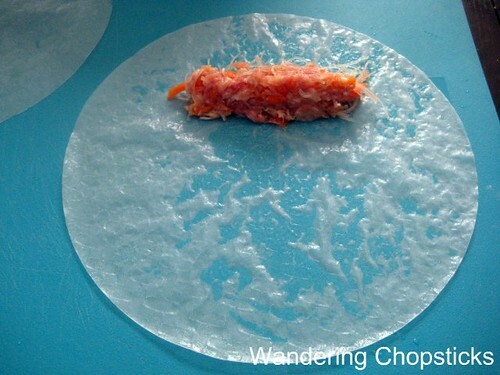 But yeah, I think some places just get lazy about making rice paper wrappers because the egg roll wrappers are easier to fry. Bubbles are OK! I wish mine had more bubbles actually so they'd be crispier. As long as your wrapper doesn't break, you're fine.